Stereolithography is the oldest method used to create 3D-printed objects. 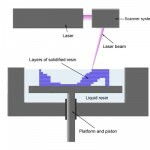 It’s the process by which a uniquely designed 3D printing machine, called a Stereolithograph apparatus (SLA) converts liquid plastic into solid objects. The process was patented as a means of rapid prototyping in 1986 by Charles Hull, co-founder of 3D Systems, Inc., a leader in the 3D printing industry. SLA printers use computer aided design (CAD) files which must be broken up into layers (STL format) before being printed in three dimensions. A platform is lowered into the resin (via an elevator system), such that the surface of the platform is a layer-thickness below the surface of the resin. The laser beam then traces the boundaries and fills in a two-dimensional cross section of the model, solidifying the resin wherever it touches. Once a layer is complete, the platform descends a layer thickness, resin flows over the first layer, and the next layer is built. This process continues until the model is complete.